The climax of an interfaith confab hosted by Lenín Moreno, the president of Ecuador, was when he lit all eight Chanukah candles. 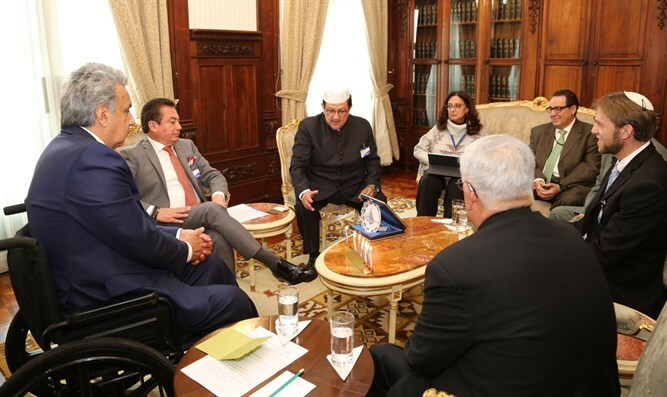 The meeting centered on a discussion of a law tied to educational matters in Ecuador, which the various religions took issue with. Although Ecuador is, by definition, a secular state, about 95% of its population is affiliated with a religion even if they aren’t fully observant. Five clerics participated in the meeting, who represent a committee that represents the 13 religious communities in Ecuador. One of those representatives was Nir Koren, an emissary of Ohr Torah Stone’s Straus-Amiel emissary serving as the community rabbi of Ecuador, who gave the president a symbolic Chanukiah, which the president used to light the candles. The Jewish community of Ecuador maintains close ties with the government. The community, which was built on the destruction caused by Kristallnacht and by Jews who fled Europe during the Second World War, has about 1,000 members. The Holocaust survivors’ bitter feelings still pervade the community’s DNA, and are mainly manifested in the community’s desire to keep to themselves and avoid standing out. Still, there are certain members of this community who are abreast of all cultural issues and who are familiar with the chain of command in the country. The Jews can be found in the most important and most sensitive places in the country, and maintain warm ties with the administration. In fact, the community was graced by the presence of the president of Ecuador during it’s 80th anniversary celebrations. Rabbi Koren reflected on celebrating the holiday outside of Israel: “Celebrating Chanukah outside of Israel is about being in a different atmosphere. In Israel, the entire country is lit up, and there is that family embrace. You don’t have that here, but the notion that you can be in such an isolated place and know that our Chanukiah is one of the few lighting up the place, both physically and spiritually, only reinforces the feeling that just a bit of light dispels much of the darkness. We are here fulfilling an important calling, feeling that was we are doing influences not just ourselves, but all Jews around the world.